Are freeze-dried mealworms as nutritious as live mealworms? My chickadees take them, but I want to make sure they are helping during this cold weather. Thanks so much. I responded that I can't think of a reason why they wouldn't be. Live mealworms freeze really fast—their frozen bodies are heavier, but the difference is almost certainly just water. I don't know that any nutritious elements would be lost in the freeze-drying process. If any listeners are aware of how freeze-drying could compromise nutritional value, please let us know. 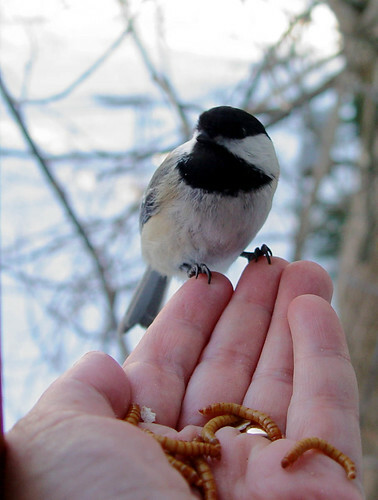 Meanwhile, chickadees are virtually always the first to discover mealworms, still alive, frozen, or freeze-dried, but in winters when Blue Jays stick around, they usually figure out how delicious and nutritious they are from watching the chickadees. I attended a presentation you gave at the Forest History Center in Grand Rapids, MN a few years ago and I remember heated birdbaths coming up. If memory serves me correctly, I thought you had said you did not recommend them in very cold temps. I thought you had said something like steam/water vapor may come off of them and even though a bird may only be perched at the birdbath, it may form on their wings and body and when they fly elsewhere it can turn to ice. Am I remembering correctly? If you have any advice on the use of heated birdbaths, especially in these extreme subzero conditions that I could pass along, or if you have a post on this on your site that you could direct me to, I would greatly appreciate it. Sue is right that I don't approve of using heated birdbaths in extreme cold. I did write about it a few times, including in my book 101 Ways to Help Birds, #50, the section about safely providing water. Birds are drawn to water year-round, and when winter temperatures are fairly mild, a birdbath can make their lives easier. But providing water in winter isn’t necessary. Birds are physiologically able to conserve water more efficiently than mammals, and they get it from eating snow or drops from melting icicles. During winter, I often set out fresh water in a shallow bowl first thing in the morning on mild days. It may remain unfrozen for several hours. During extreme cold, water vapor steaming up can be dangerous if it condenses on feathers, and during freezing weather, birds should not immerse themselves in water, period. I’ve read of several instances of starlings or Mourning Doves bathing in heated birdbaths in winter and then, after flying off, suddenly dropping like stones when their wet wings or tail feathers froze. If you do provide water in winter, cover the birdbath with a nonmetallic mesh grille (perhaps constructed of wooden dowels) that allows birds to insert their beaks for drinking but prevents them from immersing their bodies. And if the air temperature is so cold that the water starts steaming, don’t provide it at all until temperatures reach at least the high teens or twenties. 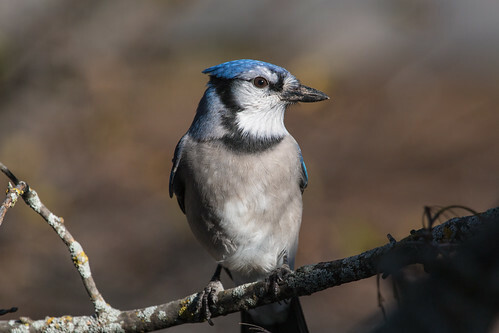 It’s just not worth the risk for our backyard birds, during National Blue Jay Awareness Month or any other time.